In our family for four generations, the family estate cultivates 29 hectares of primarily Châteauneuf-du-Pape and Côtes-du-Rhône. 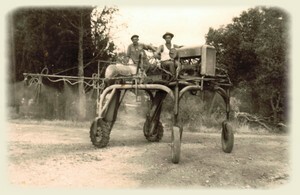 Raoul In the twenties, Raoul RAYMOND took over the reins of the family farm. He rooted up parcels of cherries to plant vines. To expand the Domaine des CIGALONS, his son Emile began to plant vines. He turned towards vine-growing. In 1978, with his help, his son-in-law Christian set up the Domaine BERTHET-RAYNE. Christian took vines from a vineyard rental system in the Barnouine soil. The Domaine BERTHET-RAYNE creates a range of wines to be sold in France. Between 1995 and 2000, the estate began to export wines in Europe, then in the United States of America. In 2003, his granddaughter Laure arrived to work with her parents followed by her husband Martial Capeau in 2005.